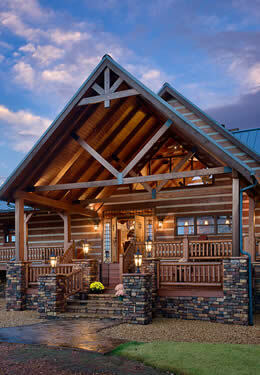 Timber Frame systems create a framework of vertical posts and horizontal beams that are exposed on the interior of the log home providing structural support while allowing for choices in materials for interior and exterior finishes from contemporary to rustic. They add majestic decorative style along with flexibility to add color and to decorate the interior. 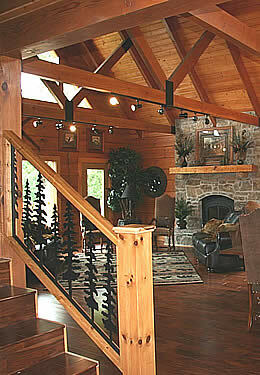 Timber frame homes give the interior the natural look of wood giving you that rustic home you’ve always wanted. Energy efficient structural insulated panels or conventional framing can both be used in timber frame homes. Choices of wood species and truss designs are endless to say nothing of the finish selections available. 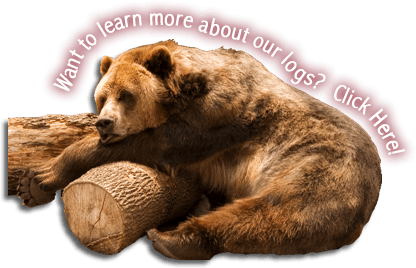 Timber frames are joined using wooden pegs that are tight fitting, which makes the structure self-supporting. Post and Beam systems are very similar to timber frame and offer the same rustic beauty and versatility in your exterior and interior wall material selections. The two terms are often used interchangeably. The basic difference is how they are joined together. The posts and beams are notched out to fit together, referred to as simple joinery, and are erected one piece at a time giving the structure stability. Both Timber Frame and Post & Beam options offer versatility, energy efficiency, openness and light, lasting strength and breathtaking beauty. Floor plans are typically open with fewer walls and halls, allow you to live easily with less square footage and are cost comparative to a custom stick-built home.Please contact us to discuss the different style options you would like to see in your custom home. I selected Bear’s Den because of a person by the name of Darlene Dawson. She was the person in charge there and from my very first contact with her, I felt very comfortable. I believed in her and she was very patient with me from the beginning and throughout the entire process. She has never let me down and I have never regretted my decision.